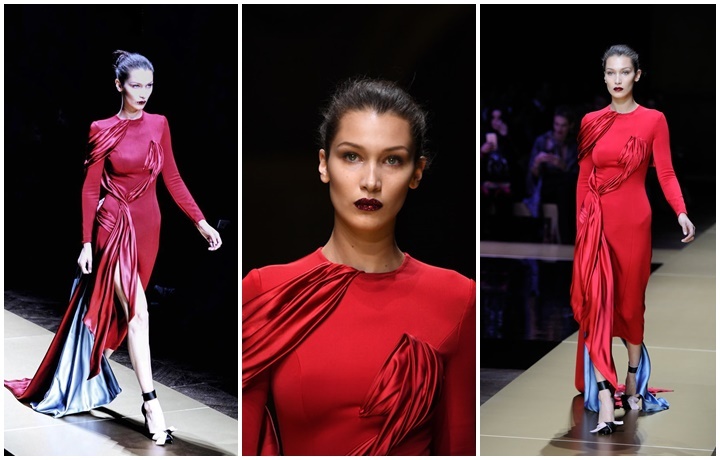 Home / bella hadid / Fashion / Haute Couture / Haute Couture Atelier Versace le 3 juillet 2016 / BELLA HADID WAS SMOKIN' HOT IN RED AT THE ATELIER LE 3 JUILLET 2016 HAUTE COUTURE. BELLA HADID WAS SMOKIN' HOT IN RED AT THE ATELIER LE 3 JUILLET 2016 HAUTE COUTURE. The Hadid sister keep slayin' on and on again, just take a look at Bella Hadid walking the runway at yet another Haute Couture show.. This red dress totally looks great on her, ni kama it was made just for her..details do matter people this dress imeongezewa tu hiko kitambaa kilichopita begani, kimeshikilia on hes chest and down to her waist and the dress looks gorgeous! !